Wild rice is a protein and fiber rich wild grain, grown and harvested throughout North America as well as China, and India. It’s flavor when cooked is slightly nutty, and with a bit of a chew similar to brown rice. 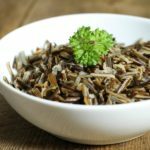 Ideal as a side dish, or used in other recipes, wild rice is healthy and best of all learning how to cook wild rice couldn’t be easier! Traditionally harvested in North America by Indigenous tribes, wild rice played in important role as a staple food, as well as in religious and medicinal uses. This wild grain makes an excellent addition to any healthy diet and is gluten free. Some of the links in this post lead to affiliate sites through which Earth, Food, and Fire may earn a small commission should you make a purchase. For more info check the Affiliate Disclaimer. Yes! Not a true rice but closely related, wild rice is full of important B vitamins (niacin, riboflavin, thiamine, folate) and minerals (Manganese, phosphorus, iron, magnesium) and stores extremely well with very little nutritional loss making it an ideal food source. Studies show that wild rice is beneficial to digestion, helps reduce cholesterol, and can reduce heart disease. With more protein per gram then white rice, wild rice is a great natural source of fiber, and is naturally gluten free. 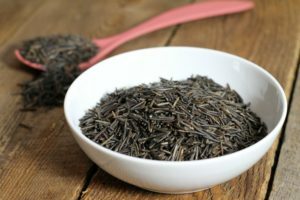 While wild rice is not a true ‘rice’ it is still considered a grain, and as such is usually avoided in diets such as the paleo or whole 30 diet. 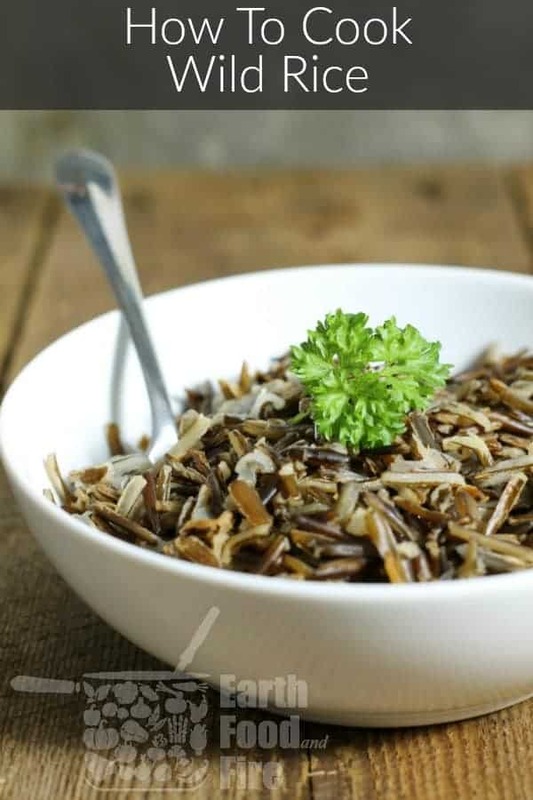 That being said, if you are looking for a healthy way to add a little carb to your diet, wild rice is probably one of the healthiest ways to do it! What Does Wild Rice Taste Like? Wild rice has a slight nutty flavor, with some describing the flavor as tea like. It’s chewy texture makes wild rice ideal for use in soups, stews, and stuffings, where the earthy flavor adds a delicious and hearty element to the dish. Depending on how long the wild rice is cooked for, it can have a bit of a chew when it is just starting to burst open, or become quite soft when cooked longer. I prefer my wild rice when it is just burst open, has a bit of a chew, but isn’t mushy. Of course the longer you cook wild rice, the more available it’s nutrients become but I find the texture more appealing when the wild rice is not cooked to mush. You can even pop wild rice in a pot on the stove much like you would popcorn! It makes a delicious snack! Do You Have To Soak Or Rinse Wild Rice Before Cooking? Do you need to soak or pre-rinse prior to cooking wild rice? Yes and no. 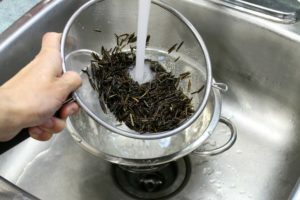 While rinsing the wild rice before cooking is always a good idea, soaking it is not required. Soaking the wild rice for 15 minutes can cut the cooking time in half, but it will also result in a softer, less textured end product. If cooking wild rice in the Instant Pot I recommend not soaking the rice to avoid over cooking it. The easiest way of cooking wild rice at home is on the stove top. While it does take quite a while to simmer, (about 40 minutes), the longer cooking time as compared to Basmati rice for example, allows you to multitask and prepare or cook something else (such as these oven baked chicken breasts ) as the wild rice cooks. Start by bringing a pot with the four cups of water to a boil. Once boiling, add the rinsed wild rice, and quickly bring the pot back to a boil. Cover the pot with a lid, and turn the heat down to medium or medium low, to allow the wild rice to simmer. Let the rice simmer for 40 to 45 minutes, before checking the rice for done-ness. Simply taste it with a spoon to check the texture. It should have a little bit of a chew, but not be hard in the middle. Some people prefer their wild rice, quite chewy and barely broken open, while others insist it must be fully burst open. I prefer it somewhere in the middle with most of the grains burst open, yet not cooked to mush. Depending on your preference simply add or subtract 5 minutes of cooking time. Depending on the size of the rice and how tight fitting a lid you used, all of the water may be absorbed or there may be a little liquid remaining. Simply strain any liquid that may remain out. Serve the wild rice immediately, or cool it down to be used in other recipes such as grain salads, or stuffings. The wild rice can be seasoned with herbs, spices, or vegetables such as onion, garlic, and mushrooms to create a hearty side dish. Learn how to cook wild rice on the stove. A healthy and delicious grain, wild rice is a great natural source of protein and fiber. Bring a pot with the four cups of water to a boil. Once boiling, add the rinsed wild rice, and quickly bring the pot back to a boil. Cover the pot with a lid, and turn the heat down to medium or medium low. Let the rice simmer for 40 to 45 minutes. Checkthe rice for done-ness. Simply taste it with a spoon to check the texture. It should have a little bit of a chew, but not be hard in the middle. If there is a little liquid remaining in the pot, simply strain it out. This may happen depending on the variety, size of the wild rice etc. Serve the cooked wild rice immediately. It may also be cooled down to be used in other recipes such as grain salads, or stuffings. How do you cook it in the instant pot? Hey! If you are planning on cooking wild rice in the Instant Pot, I would suggest reading my guide to cooking wild rice in the Instant Pot first. Generally, though, you would simply add even parts of wild rice and water, and then cook it on a manual setting anywhere from 28 to 32 minutes, depending on how well done you like it. This is great. I love wild rice – it has so much flavour and looks so pretty compared with plain white rice. Such great tips and info about wild rice and how to make great rice! Love love wild rice! Thanks for the tip about washing and soaking. I try to buy rice that’s already pre-washed (because who has the time) but it’s not always possible. Nice to know you can skip the soaking or do it to speed up the cooking process! I didn’t know you could buy it pre washed! Do you prefer certain brand? 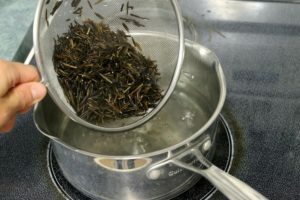 I could never place it until you mentioned that some people describe the flavor of wild rice as tea-like. That’s totally what it tastes like! I always thought it was a bit floral, but tea is a better descriptor. 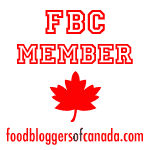 We don’t have wild rice too often, but this post has inspired me to change that! I know! The flavor is quite unique. It’s delicate enough that it goes well with almost all proteins! I’m working on a turkey wild rice soup as we speak! The hubs is in charge of meals this week and he just asked me to pick up some rice. I think I’ll grab wild rice to pair with our chicken. I always rinse my rice but I never knew that soaking can cut cook time down. I’ll have to try it out! What a great primer! I love wild rice in a cold salad but haven’t gotten the gumption up to try one myself. This will help me give it a go. It’s not to hard! Hope you give it a go! This is a great post to learn how to make wild rice. I’ve made it with a mix, but never from scratch. 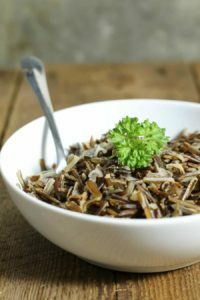 So glad to find this post because my family really loves dishes with wild rice! Glad to hear it! I know the wild rice mix is popular. I find it difficult to cook because all the different varieties of rice take differing times to cook. It is tasty though! We love wild rice, sometimes add with basmati, sometimes on its own for a salad, such a healthy and delicious rice. Lovely tutorial. I could eat wild rice everyday, such a great flavour and texture! Thank you for sharing such detailed instructions, super helpful! Yy! I’ve been trying to eat more of it myself! Super tasty, and so good for you! I love wild rice but don’t make it often because my husband doesn’t like the texture. I will be trying it out again soon, though! Thanks for the great post. Your welcome! Have you tried using it in soups and salads so that there isn’t so much of it there? It will hide the texture a bit. You could also cook it lonbger to soften up the rice more! I love wild rice, but have not made it in a long time. Thank you for sharing detailed instructions to make it. I absolutely love wild rice, but rarely make it. Thank you for the great instruction on how to cook it. Same here! I find it’s easy to get stuck in a rut cooking the same things over, and over, this was part of an effort to break that and cook a wider variety of foods more often! This is a great tutorial on how to cook wild rice thanks for sharing! I usually make Wild Rice Soup and the family love it. Have not tried cooking the same way you did. I’m planning a wild ricee turky soup for next week! Gonna be yummy!!! I love wild rice but I honestly cant remember the last time I made it. Thanks for the reminder that I need to add this gorgeous grain back into the dinner rotation! It’s such a healthy grain, I am trying to get my family to eat it more often as well!